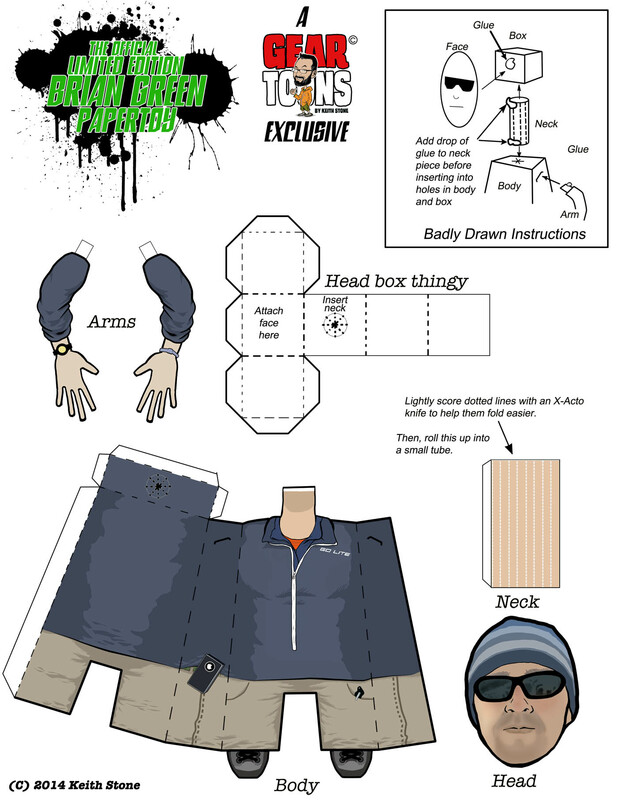 Hiking gear reviews for hikers with short attention spans. Okay, this thing has gotten quite a few positive comments since I posted it on Facebook, so I thought I’d post the template so you guys can print out and assemble your very own Brian Green papertoy. Carry him wherever you go! I should have created his sidekick, Coco the Hiking Dog, but I had a hard time finding an appropriate dog papertoy template online. Perhaps that will be part of the BG 2.0 Playset released just in time for Christmas 2014? 😉 Kidding. For those who haven’t noticed, this is a 3D representation of Brian’s profile pic on the Brian’s Backpacking Blog Facebook page. And here’s the templates in PDF format, both the figure model and the background picture display. 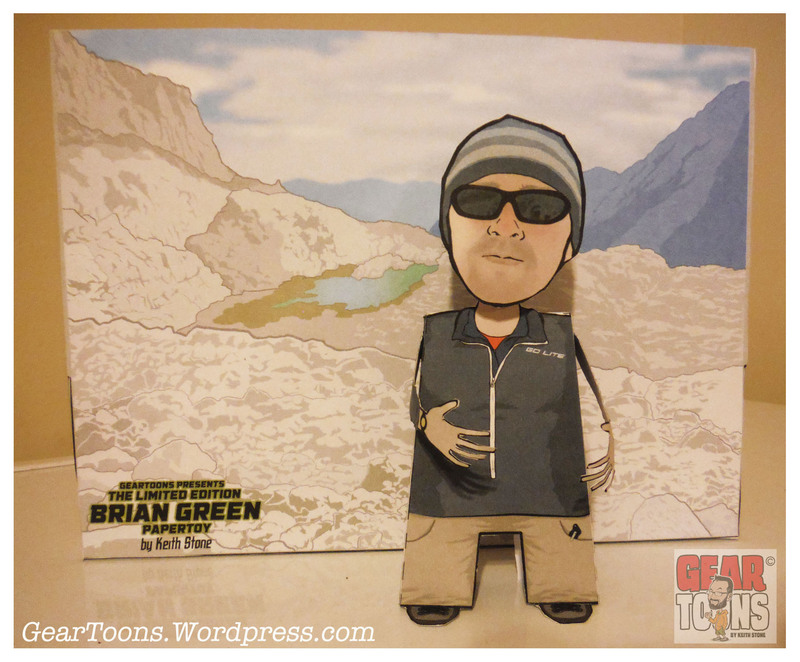 I know a paper toy model isn’t normally what you expect to see on an ‘outdoor blog’, but when I started GearToons, I decided that I wanted to do something unique and looked at hiking and backpacking from my perspective in life and included the things I love, like art, comics and humor. I plan to continue doing my little blog thing here as long as I’m having a good time and everyone else is, too. 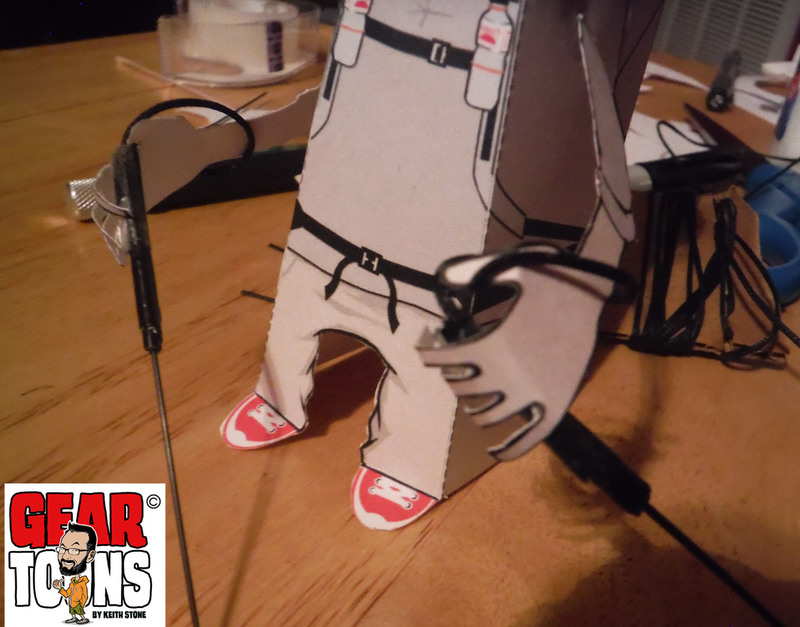 BTW, if any of you are interested in commissioning a personalized papertoy for yourself, email me at geartoonblog@gmail.com or PM me at the GearToons Facebook page. Categories: Uncategorized | Tags: Contest, papertoy | Permalink. 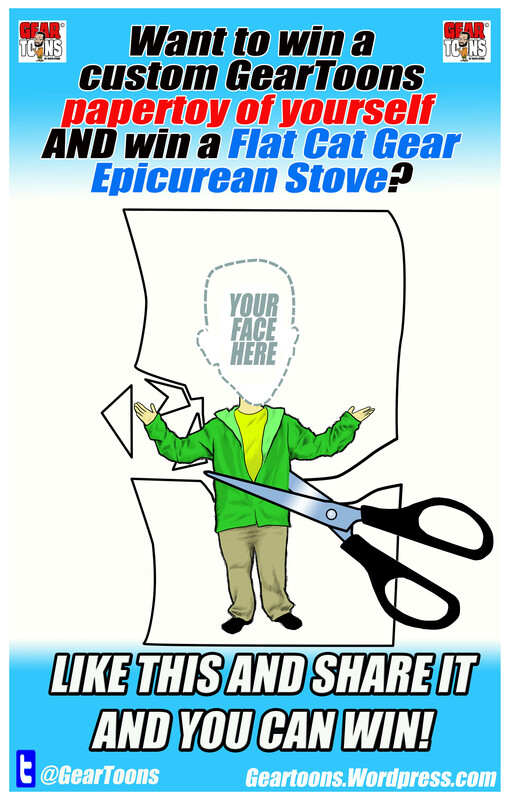 I’m running a contest on the GearToons Facebook page in which I’m giving away not only a sweet Epicurean Titanium solid fuel stove from Flat Cat Gear, but also a custom papertoy. (The contest runs from Feb.24-March 3, 2014). If you’re curious what a papertoy is, its just a modernized form of origami. I love to draw just as much as I love to hike, so when I’m not outdoors, I’m sitting in front of a Macbook and Wacom tablet. In order to get a good likeness for the papertoy, the winner will need to email me at least two good (read: not grainy or pixelated) pictures of their face. I use a combination of rotoscoping and plain ol’ comic book inking techniques to draw these, so a good photo is critical. To receive the papertoy, I will either email it to the winner, so they will be able to print it out on their own choice of paper and assemble it themselves OR the papertoy will be printed on thick card stock paper, assembled by me and mailed to the winner. IMPORTANT: Continental US mail delivery only for the prizes. Sorry. Please don’t hate me. If you have any questions, just ask. 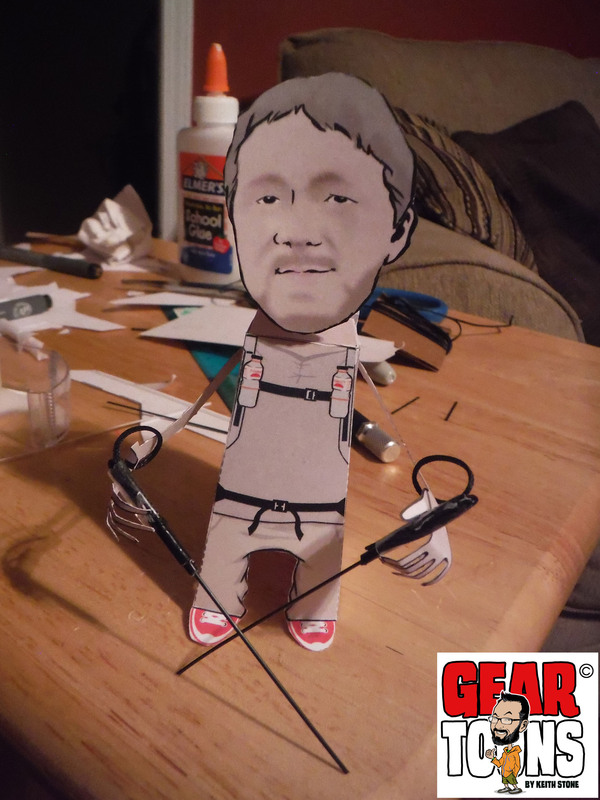 To get a better idea of what the custom papertoy will kind of like, here’s a picture of one I did for my buddy Chad (“Stick” of Stick’s Blog) recently. I used the logo I did for him a while back, as a foundation. Designed in Photoshop & Illustrator. Printed on card stock paper. Stands about 5″ tall. The trekking poles are made from bristles from my kitchen broom, tiny strips of duct tape (for the handles) and polyester cord I got from Zpacks. 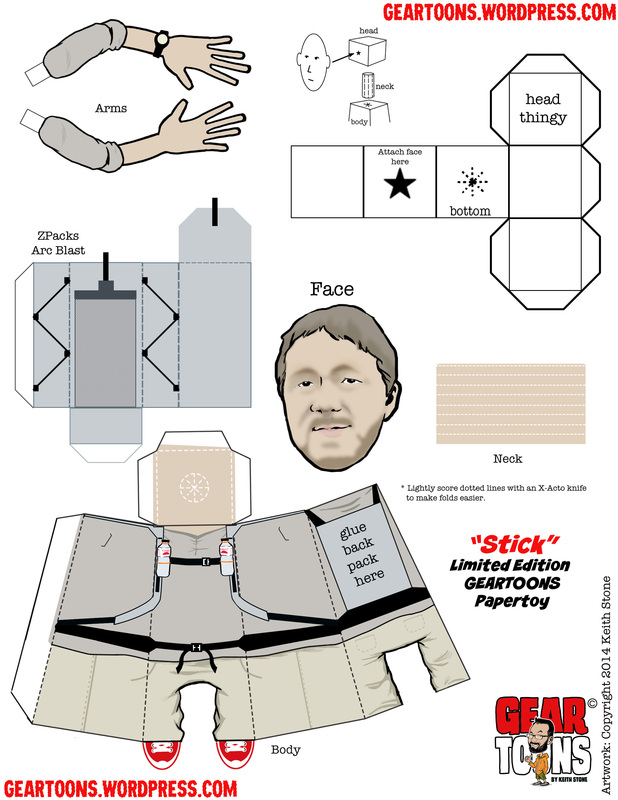 If you like the ‘Stick papertoy’ above and want to print and assemble your own, click on the image below or download the template in PDF format here: ===> stick-papertoy-rev1. If you are interested in having me design a personalized papertoy for you, email me about doing a commission. Or I’ll draw you a personalized comic. Heck, I’ll draw you as a pink Sasquatch beating up Spiderman, if you want. Give me a holla @ geartoonblog@gmail.com. Categories: Comics, Uncategorized | Tags: Contest, papertoy | Permalink.